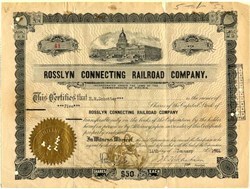 Beautiful certificate from the Rosslyn Connecting Railroad Company issued in 1944. This historic document was printed by Goes and has an ornate border around it with a vignette of the capitol building. This item has the signatures of the Company's President and Secretary and is over 63 years old. Shows signs of wear. Chapter 194 of the 1853 Session Laws of Maryland, passed May 6, 1853, chartered the Baltimore and Potomac Rail Road Company. This company had the authority to construct a railroad from the city of Baltimore via Upper Marlboro and Port Tobacco to a point on the Potomac River between Liverpool Point and the St. Marys River, and any branches of at most 20 miles (32 km) in length. The company was organized on December 19, 1858, and began surveying the route May 3, 1859. Construction started in 1861 but progressed slowly until 1867, when the Pennsylvania Railroad (PRR) and its ally the Northern Central Railway bought the company. The PRR at the time had access to Baltimore via its own lines (the Northern Central Railway from the north and the Philadelphia, Wilmington and Baltimore Railroad from the northeast), but used the Baltimore and Ohio Railroad (B&O) and its Washington Branch to continue southwest to Washington. The PRR and B&O had trouble getting along, but Maryland refused to grant a charter to end the B&O's monopoly on Baltimore-Washington travel. However, the Baltimore and Potomac charter allowed exactly that, via the clause that allowed branches; all the PRR had to do was take the line within 20 miles of Washington. The PRR obtained a charter for the section in Washington on February 5, 1867. The original Washington station was on the National Mall, at the present location of the National Gallery of Art, at the southwest corner of Sixth Street NW and Constitution Avenue. Tracks ran south from there along Sixth Street to a wye in Sixth Street, Maryland Avenue and Virginia Avenue. Ironically, the tracks along Maryland Avenue ran over the Long Bridge (now the 14th Street Bridge) to Virginia, and the tracks along Virginia Avenue went east into Maryland. Continuing south in Virginia was the Alexandria and Washington Railroad, opened in 1857. The Baltimore and Potomac acquired this line after reaching it, operating it until 1901, when the Washington Southern Railway (the successor of the Alexandria and Washington) was taken over by the Richmond, Fredericksburg and Potomac Railroad, an independent bridge line owned equally by the PRR and five other railroads. Soon after, in 1904, the line from the Long Bridge to Rosslyn, built by the Washington Southern, was split off into the Rosslyn Connecting Railroad, owned by the PRR. The Washington Terminal Company and its Union Station opened in 1907, resulting in the closure of the old station on the Mall, and the diversion of all passenger trains to a new alignment, splitting from the old one at Landover and running west to merge with the Baltimore and Ohio Railroad's Washington Branch on the approach to the new station. On November 1, 1902, the Baltimore and Potomac was consolidated with the Philadelphia, Wilmington and Baltimore Railroad to form the Philadelphia, Baltimore and Washington Railroad, also controlled by PRR. Since then, the line has passed under control of Penn Central, Conrail and Amtrak. Since the breakup of Conrail, Norfolk Southern has provided freight service over the mainline. However, the Pope's Creek branch (originally part of the chartered mainline) is operated by CSX Transportation.